I'm trying to do a ?simple? difference extrusion to cut away part of my model. The sketch seems to be in order, but when I do the extrusion, most of the lines turn bold and red and the surfaces at that area disappear. Anyone know what I've done wrong? 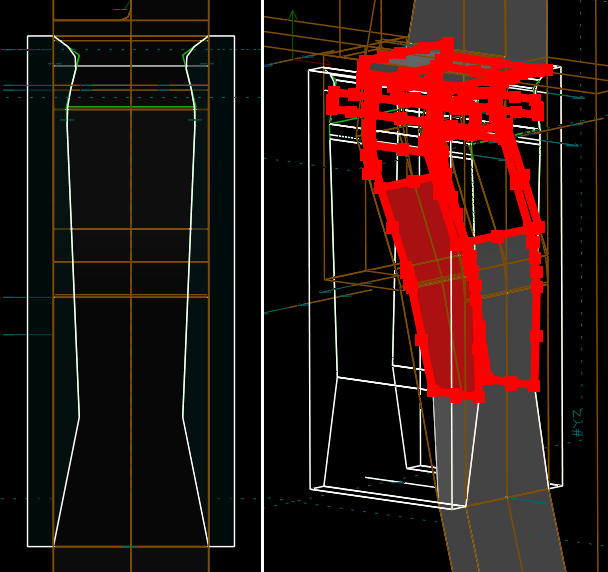 SolveSpace's NURBS Booleans are unfortunately not perfectly robust, and this is what happens when they fail. If you post the .slvs file, then I may be able to suggest a different way to build your geometry that will succeed. Alternatively, you can check "force NURBS surfaces to triangle mesh" in the extrusion group's browser screen to try the Boolean on the triangle mesh instead. This is more likely to succeed, but loses the ability to export NURBS (e.g., a STEP file). You're right, the "force NURBS surfaces" option does get rid of the error. Here's the .slvs file though. Thanks!